On January 1, the New Year’s Day Service for the 182nd year of the Teaching (2019) was duly performed at 5:00 a.m. in the Main Sanctuary with the Successor-Designate Daisuke Nakayama as chief officiant. Many followers who had gathered at the Home of the Parent before daybreak attended the first Service of the year with a fresh resolve to make further efforts to promote world salvation. At the appointed time, Rev. Nakayama and other Service performers left the Staff Quarters and paid their respects at the Foundress’ Sanctuary and the Memorial Hall before proceeding to the Main Sanctuary. 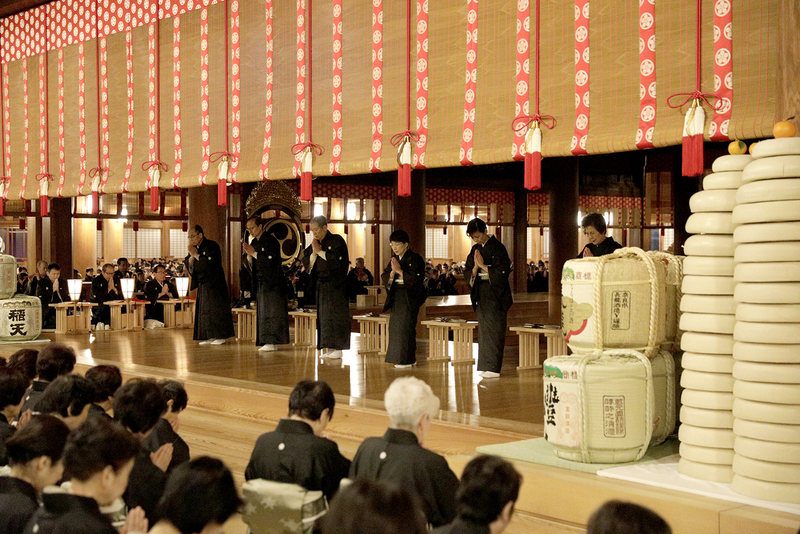 After the prayer, the Kagura Service and the Dance with Hand Movements were performed joyously, with the followers joining in singing the songs for the Service in unity of mind.